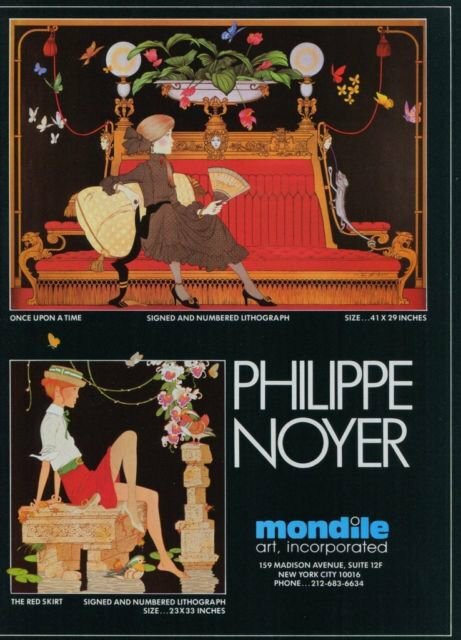 Original magazine advertisement from the year 1982 for Philippe Noyer and Mondile Art. Advertised on the page are two works by Noyer, titled "Once Upon a Time" and "The Red Skirt," to be published/distributed by Mondial Art. (Please note that this is a magazine advertisement/magazine clipping only and that no prints or other items are included.) The advertisement was carefully removed directly from a magazine. The page measures approximately 7 5/8 inches wide by 10 1/2 inches high (including margins. if any).